5 Seconds of Summer's sophomore album may be titled Sounds Good Feels Good, but there are several tracks on the album that are tinged with a poignant darkness — most notably "Broken Home," a deeply emotional song about the aftermath of a parents' split that is quickly becoming a fan favorite. If the lyrics of 5SOS' "Broken Home" don't cut straight through to your core on first listen, then the band's powerful delivery will most likely set off something — a lump in your throat, a pit in your stomach — that immediately connects you to the visceral emotions of the song. Like Pink's "Family Portrait" or Blink-182's "Stay Together For The Kids," 5SOS' "Broken Home" is an important narrative about divorce, an incredibly moving song about feeling alone and angry as everything you love falls apart around you. "Broken Home" — an idea initially pitched by Benji Madden and co-written by 5SOS — is a song about isolation, wanting to be heard, and the desperate, desperate desire to have things be different than how they are in reality. It is a track that those who do come from split families can connect with on a deep level, and those who don't can strongly identify with as well. Since Ashton Irwin is the only member of the band who comes from a single-parent home, he immediately related to "Broken Home," producer and songwriter John Feldmann told Fuse about the track, revealing that the drummer felt that the song was almost like a call-to-action to their fans. He said of Irwin's thoughts, "'We're saying something with this song, it's going to connect with the audience, at least 50 percent of our audience come from broken homes. We're actually taking a stand.'" The rest of the band, however, was concerned with the authenticity of the song since they do not come from split families themselves. "The other guys are loyal and family-driven and sweet, so they were like, 'What are our parents going to think about us singing about a broken home when we don't come from broken homes? How authentic is it?'" Feldmann recalled. "It was a two-month debate." It was a debate that fortunately resulted in the inclusion of the song on Sounds Good, a decision that was undoubtedly the right one based on fan reaction alone ("Broken Home" was trending on Twitter after Thursday's midnight release). And despite the band's fears, their parents loved the tune. 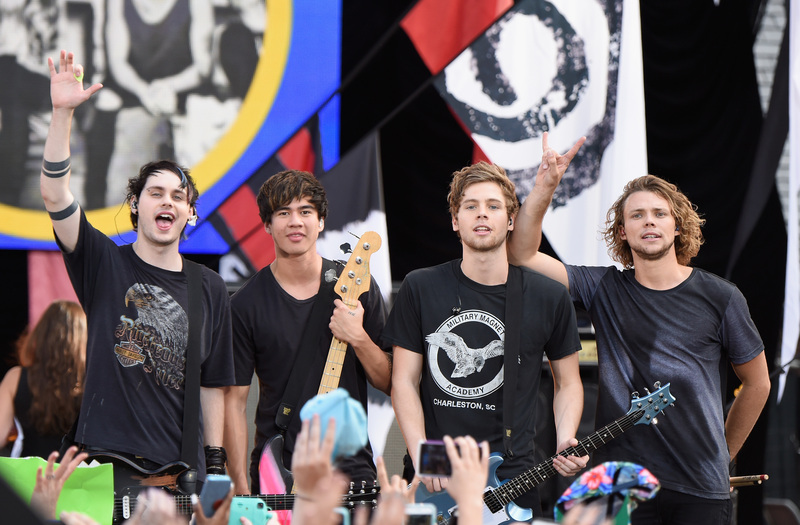 "Never had a song make me cry like 'Broken Home' before," Luke Hemmings' mother Liz tweeted. "So powerful." As did the fandom, who felt nothing but authenticity emanating from the stirring track. It is not hard for 5SOS fans to find moments in the song that speak to them — no matter their home life situation. Let's take a deeper look into the lyrics. "She would hope / She would pray / She was waiting it out / Holding on to a dream while she watches these walls fall down"
For anyone going through a difficult time and desperately wishing that the situation were different, these lyrics will twist at your heart. That willingness to do anything to fix the problem to only have it be out of your control is an immensely difficult life lesson to learn. "Sharp words, like knives / They were cutting her down / Shattered glass, like the past / It's a memory now"
While these lyrics most blatantly refer to a daughter overhearing her parents fighting, they can also apply to anyone who has been bullied. It's an important reminder that words carry within them a strength sometimes more powerful than physical pain. "Hey Mom, Hey Dad, when did this end? / When did you lose your happiness? / I'm here alone inside of this broken home"
Whether it's coming from Calum Hood's deep vocals or Luke Hemmings' urgent, higher-pitched pleas, these are the lyrics that get to the heart of "Broken Home" and echo questions that kids all over the world ask themselves every day. "Who's right, who's wrong, who really cares? / The fault, the blame, the pain's still there"
At the end of the day, it's not about whose fault it is; it's about who has been hurt by the fighting. "Wrote it down on the walls / She was screaming it out / Ain't it clear, she's still here / Are you listening now?" One of my favorite lyrics on the track, I can so relate to that overwhelming desire to be heard and have a voice when you feel like you're drowning in other people's narratives. "All the battles, all the wars, all the time that you fought / She's the scar she's the bruises, she's the pain that you brought"
Another intensely powerful line, this lyric points out that despite the endless jabs parents may lob at each other, the person being affected most by the fighting is your child. "The painted memories / That washed out all of the seas / I'm stuck in between a nightmare and lost dreams"
There is no position more difficult to be in than one of ambiguity — and when that "in-between" is the middle of harsh reality and the fantasy you wish you could've held onto just a little bit longer, it seems almost impossible to just sit there and deal with that kind of pain. But the only way out is through it — and you'll get there. 5 Seconds of Summer's Sounds Good, Feels Good is out as of Friday, Oct. 23.